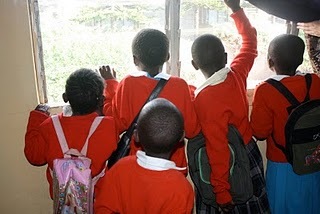 Shofco > News > Margaret’s Safe Place Opens! After school let out, the girls walked to the house with teacher Julia, our administrator, our social worker, and several of our American volunteers. We were struck by how few belongings they had — one of our volunteers realized she had more in her day’s backpack than these girls had in the world. The walk over was very sweet; the girls held hands the whole way there, and we could see the start of a lovely new family dynamic. When they arrived, we gave them a tour of the house, including their new backyard with banana trees! 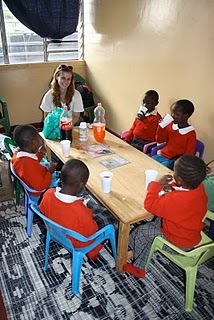 Teacher Julia is seen here helping the girls feel comfortable in their new home. The girls excitedly ran up the stairs and discovered their names on their doors, and they were thrilled about their new rooms with bunk beds, flip-flops (“slippers”), toothbrushes and toothpaste, towels, and of course… beanie babies! Once they had settled down about their new “slippers,” the girls were enchanted by the window. They are not accustomed to having more than one level in a home, and are definitely not used to a room with a view. They stood in front of the window for several minutes pointing out anything they could see. The girls are so happy to be living with their friends – it is such a wonderful environment for them. They quickly figured out that they can play together whenever they want now, and they didn’t waste any time! They had a blast running around in the front yard. Once the girls had seen their new house, we sat down at the living room table to have a little soda to celebrate their big move. We are incredibly grateful to Margaret and Bob Patricelli for giving these girls a beautiful, safe home! Having seen Kibera, I can’t imagine what makes them the most vulnerable, I would wish for homes like this for all the girls. What a great start! Thanks for all you wonderful people and what you do.